Google has been trying to get into the living room for a long time, but it hasn't always worked out. The Google TV platform it launched four years ago never really took off and the curiously shaped Nexus Q was so beleaguered by its limited functions and high price that it didn't stand a chance. Last year, however, Google finally managed to get a taste of success with the Chromecast, an inexpensive video-streaming dongle that was so simple it eschewed the need for a remote control or dedicated UI. Almost too simple, some would say -- you still need another device lying around to cast content to it and the lack of a UI means it's not quite as user-friendly as a Roku or an Apple TV. 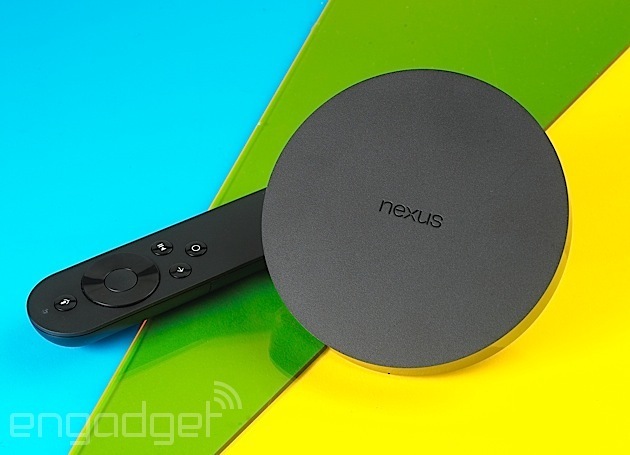 The Nexus Player is a great, if imperfect, introductory showcase for Android TV. It doesn't have an Ethernet port and suffers from a few bugs, but Android TV's simple interface, intelligent voice search and Google Cast abilities more than make up for it. 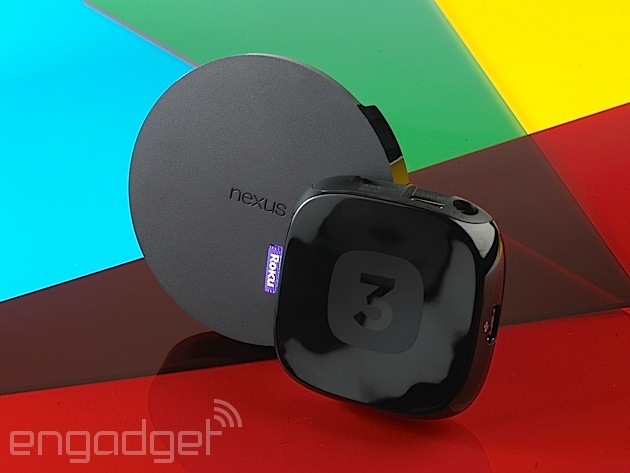 How would you rate the Nexus Player? So, Google is taking yet another stab at home entertainment with Android TV, a version of the Android OS rejiggered for the living room. Fittingly, the first Android TV device out of the gate is Google's own Nexus Player, a set-top box made in partnership with ASUS. Unlike the Chromecast, the Nexus Player (and the Android TV ecosystem in general) is squarely going up against the likes of Roku and is also positioned to take on the Amazon Fire TV with its Android-based gaming chops. But can it? 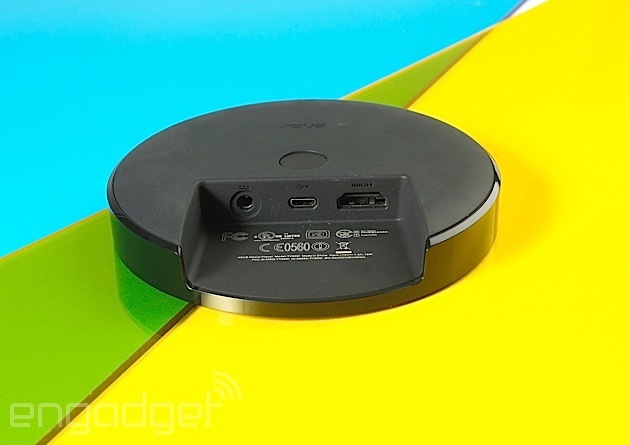 The ASUS-made Nexus Player could essentially be described as a large hockey puck. It's a flat, disc-shaped device with the Nexus logo proudly inscribed on top. Yet, unlike the spherical Nexus Q, the Player is quite inconspicuous. Sure, its slightly unusual circular design might stand out amidst your home theater setup, but its small footprint and compact form factor -- it's barely the size of my hand -- means you probably won't notice it most of the time. Indeed, the only indication that it's powered on is a small LED positioned underneath the unit. That, combined with the fact that the remote works over Bluetooth and not IR, means you could tuck it out of sight and never have to deal with it once it's hooked up. Speaking of which, setup is pretty easy. Simply plug the player into a power outlet, connect it to your TV with an HDMI cable (which is sadly not included) and you're done. There's also a micro-USB port located on the rear, which Google tells us is for developers to use to create and debug apps. If you decide to get a gamepad (which I'll get to shortly), there's also a button underneath the Player that you can press to initiate the Bluetooth pairing process with the accessory. From there, setup is as easy as going through the on-screen instructions: You'll pair your remote, choose your WiFi network and sign in with your Google account. And no, there's no Ethernet port: The Nexus Player is WiFi-only by default. That might not be a big deal for some, but I would've really liked the option; streaming videos over wired connections is typically faster and more reliable than wireless. You could get a micro-USB-to-Ethernet adapter, but that's an additional cost you would have to factor in. On the inside, there's a 1.8GHz quad-core Intel Atom processor plus an Imagination PowerVR Series 6 Graphics 2D/3D Engine, which makes it more powerful than most, if not all, other streaming devices on the market. Navigating through the menus certainly feels zippy enough, and I experienced no noticeable lag when launching apps or playing games. It has 1GB of RAM and 8GB of storage, though the actual capacity might be less. That isn't a whole lot of space, which means you'll need to be careful not to load too many games on here. The Nexus Player has a dead-simple remote control that's slim, lightweight and home to just a few buttons. It's curved on the sides, so it nestles comfortably in your palm. And, just like the Fire TV's remote, it has a slight groove on the underside for your finger as well. Since the Fire TV is also based on Android OS, it's no surprise that the button layout is similar. There's a voice search button right at the top and a large, circular directional pad underneath. But the similarities end there. Instead of going with the traditional Android navigation controls, the only other keys are a Back button, a Home button (it's the one with the circle on it) and one for play/pause. The remote's overall build quality is a little chintzy, but the buttons have great travel and a nice "clicky" feel when pressed. If you'd prefer to use your Android phone as a remote instead, no problem: There's also a handy Android TV Remote Control app in the Play store. I installed it on a Samsung Galaxy S5 and was able to navigate through the menus just like I did with the physical remote. 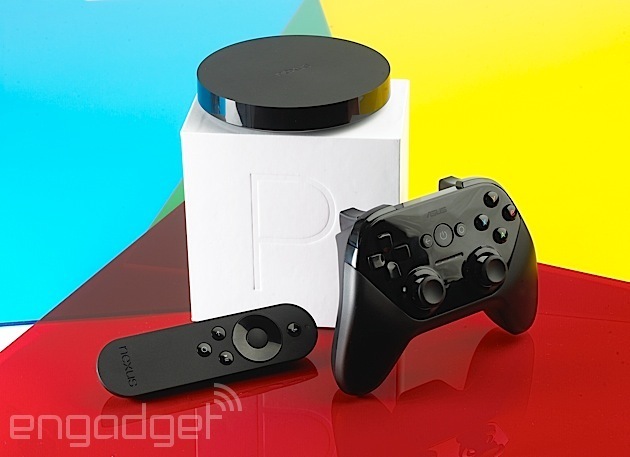 The Nexus Player is more than just a streaming box; you can also use it to play games. And while you can certainly play some of them with the regular ol' TV remote, it's much easier to execute killer combo kicks or maneuver hairpin turns on a racetrack with an actual game controller. So, if you so choose, you can purchase the optional Gamepad for the Nexus Player for $40. The ASUS gamepad looks a lot like the Xbox 360's controller, but with a joystick arrangement that's more similar to the PlayStation's. In other words, the d-Pad is on the left; the two analog joysticks are in the middle toward you; and the four face buttons are on the right. Positioned in the center are the back, power and home buttons, while the triggers and shoulder buttons are located on the rear. The buttons aren't nearly as polished as the ones for the Xbox; the aforementioned triggers are on the squishy side, while the d-pad just feels clunky and cheap. Still, it gets the job done most of the time. 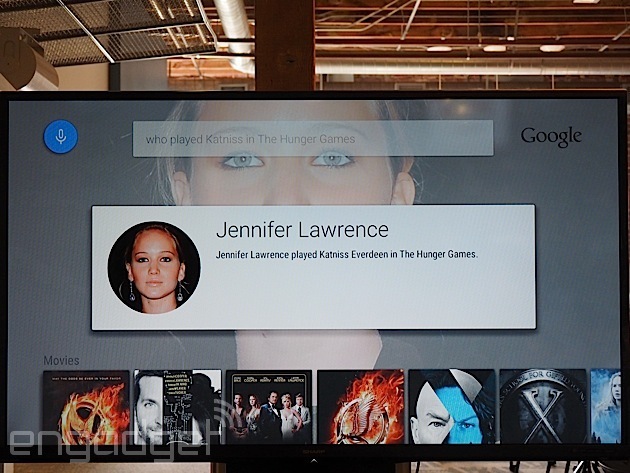 As we saw a few months ago at Google I/O, Android TV has a fairly simple card-based user interface. You'll see a list of recommended titles and recently played shows at the top, and beneath that are your installed apps. YouTube and Songza come preloaded, as well as all the Google Play apps like Movies & TV, the Play store, Music and Games. Underneath that is a list of installed games, and right at the bottom is access to the usual network and display settings. Most apps look the same, with the navigation menu situated on the left and the various options on the right. Right at the top of the home screen, however, you'll see a search prompt along with the current time. You could go ahead and click on that button to start a search, but it's far easier to just click on the microphone button on your remote and speak into it -- a small LED on the remote will blink to indicate it's listening. The voice interface works very much like Google Now in that you can ask pretty much any question and it'll try to respond as best as it can. And so I did. One of my questions was, "Who is Neil Gaiman?" and it brought up a brief biography (which it'll actually read to you) along with relevant links on YouTube, related movies such as Stardust and Coraline and a list of people who are connected to him. When I asked, "Who is Doctor Who?" it pulled up a brief description of the show, a list of current and previous cast members, YouTube links and, of course, a link to the Movies & TV app where you could choose to rent or buy episodes. I also queried "Oscar-nominated movies 2011" and it returned with a list of the films that were up for an Academy Award that year. Bear in mind, however, that all of the movies and TV show links that the search feature brings back will undoubtedly lead to Google's own Movies & TV offerings. In other words, you won't find links to Netflix or Hulu or other content sources even if you have those apps installed. That's not entirely surprising given that this is Google's TV platform, but be sure to check that a show or movie is available on those other services before you plunk down your Google Wallet cash for the evening's entertainment. The voice recognition is accurate for the most part, but I did encounter a few occasions when it wouldn't understand me, interpreting "acted in" as "accident" for example, even after I enunciated the words slowly and carefully. Additionally, sometimes I would ask a question and the light would continue to blink, as if it were waiting for me to finish my query. I had to then press the center circle pad to confirm that I was done. It's clear the voice-input feature, while good, still has room for improvement. 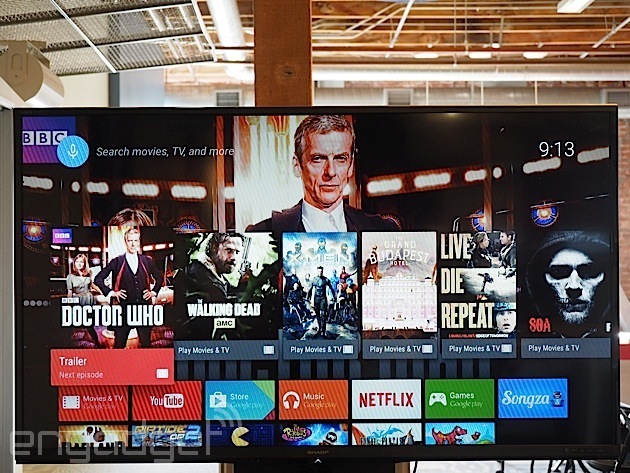 Android TV is relatively young, so there aren't too many third-party apps for it just yet. But it does come with the two mainstays -- Netflix and Hulu Plus -- which should satisfy most people. Other entertainment apps include Food Network, PBS Kids, Bloomberg TV, UVideos, TED TV, Crackle, Plex, Red Bull TV, HuffPost Live, DramaFever, AOL On, Dailymotion, Pluto and Madefire Motion Books & Comics. There's also a variety of music apps beyond Google's own to choose from: Vevo, iHeartRadio, Pandora, MusiXmatch and TuneIn. If you're thinking, "But where's Rdio? Spotify? How about HBO Go?" then you might be initially disappointed by their absence here. But there's no need to fret, as Android TV also wisely supports Google Cast, which means that any app that can be streamed to the Chromecast can also be streamed to an Android TV device. This means you can continue to use Rdio, Spotify, HBO Go and countless other Chromecast-compatible apps with the Nexus Player. I managed to watch the latest episode of Game of Thrones by selecting the "Nexus Player" dropdown in the HBO Go iPad app, and it works just like it does with the Chromecast. As for games, there appears to be quite a number of them available at launch -- I counted around 50, most of which are compatible with the optional Gamepad. I downloaded a few games to test the controller out -- Final Fantasy III, Riptide GP2, Rabbids Big Bang and good ol' Pac-Man. Some of them certainly felt as if they were tablet games shoehorned into a console experience (e.g., commands like "Touch to start"), but it wasn't as bad as I thought. Racing the hydro jets in Riptide GP2, for example, felt just as quick and responsive as most console racing games, with good graphics and no noticeable lag. Yet, I did encounter a few problems where an app would crash or I would lose connection with the controllers. I would just be tinkering with a game's display settings, for example, and it would stall. Once when I was playing Rabbids, I lost Bluetooth connectivity with my Gamepad controller entirely. I'm not sure whether to blame the hardware or the software here, but suffice to say that the fit and finish of Android TV is not quite done. The Nexus Player's most direct competitor is Amazon's Fire TV, which also costs $99. It offers a nearly identical feature set, except that Amazon promotes its own content, while the Player is all about pushing Google Play. Amazon's Fire TV seems to have a more robust game library from the outset, and it does have Ethernet while the Player doesn't. However, the Player has a huge ace up its sleeve with Google Cast and a long list of Chromecast-compatible apps, which seems to be growing all the time. When you throw in the wider Android ecosystem into the mix and the potential for lots more apps and games over time, it tips the scales in favor of the Nexus Player. Of course, I would be remiss if I didn't mention the Roku 3 and the Apple TV, the two other set-top juggernauts on the market. The $100 Roku 3 is perhaps the most formidable in terms of pure content selection -- it supports video content from both Google Play and Amazon along with a whole host of providers that make the lack of Chromecast compatibility acceptable. It also has an Ethernet port, which the Nexus Player lacks, and the remote control has a headset jack. Yet, it doesn't offer quite the same gaming experience and it doesn't have that neat voice search feature that both the Fire TV and the Nexus Player have. The Apple TV, which also costs $99, is on another planet altogether, with an ecosystem all its own. If you're an iTunes addict, you would do wise to stick to the Apple TV no matter what. 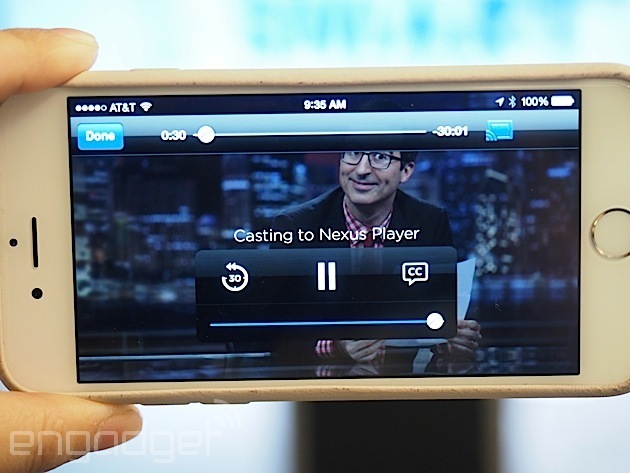 Additionally, if you have an iPhone or an iPad, you can stream content to it over AirPlay, which is essentially its answer to the Chromecast. But if you like the option of a game library or a video source from Google or Amazon, Apple TV is certainly not for you. Last, but certainly not least is Google's own Chromecast. The $35 dongle does offer huge bang for the buck; the ability to cram in so many streaming services in a tiny, affordable package is very attractive. But, as I mentioned up top, it can be considered almost too simple -- there's no real UI and you do need an external device to stream to it. In a way, the Nexus Player is like the Chromecast on steroids -- it combines all of its functionality with a real set-top interface, gaming features, access to Google's own Play store and more. Is that worth the extra $64? I certainly think so. 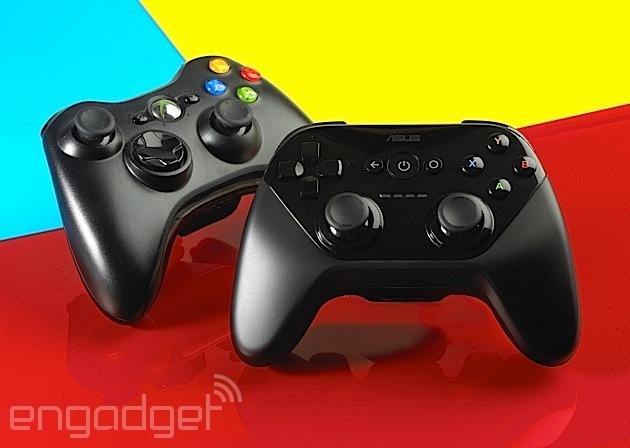 The Nexus Player is a fantastic, if flawed, introduction to Android TV. Yes, it has a few bugs and it doesn't quite have the app library that its competitors have. The gaming experience also seems completely secondary, as none of the currently available titles are that compelling and most don't appear to be configured with the television in mind. Also, Android TV might not sit well with you if you're not a big consumer of content from Google's Movies & TV library. But if you are, or if you're at least open to the idea, then the Nexus Player is a very compelling proposition. As I mentioned above, Android TV essentially makes the Nexus Player a grown-up Chromecast. You can stream content to it just like you would with the $35 dongle thanks to Google Cast, but you also get an actual, well-designed user interface, a real remote control, a pretty good voice search interface and the entire Android ecosystem for not that much more. While I hesitate to recommend the Nexus Player due to some chintzy hardware and the lack of Ethernet, Android TV is a platform worth keeping an eye on.